Medieval France had a serious dragon problem. Dragons were so thick on the ground that you couldn’t swing a saint without hitting one. Surprisingly, I don’t mention “saint-swinging” metaphorically, as throughout the Middle Ages the Gallic standard operating procedure for effectively dealing with dragon infestations was to sic a saint on them from St. Cadon at Karnac, St. Naudet and St. Pol de Leon at Batz, St. Radegond in Poictiers fighting the dragon called Grand Gueule, St. Martha in Tarascon, Provence taming the dragon Tarasque, to St. Front in Bergerac. 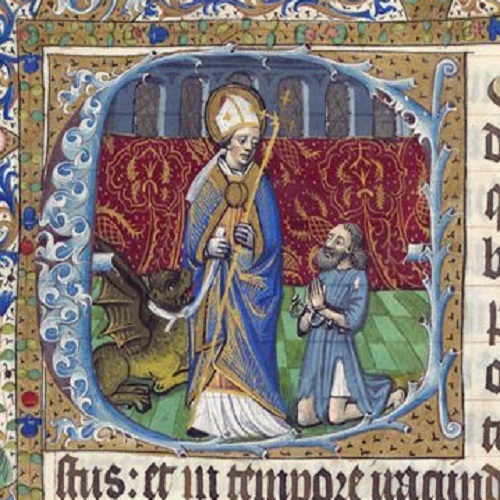 It almost seems as if there are two important medieval qualifications for Catholic canonization: (1) being French, and (2) putting the hurt on a dragon. One such smackdown by Saint Romanus (or Romain) of Rouen (died 640 A.D.) involved wrangling a 7th Century fire-breathing water dragon that terrorized the villages along the Seine by the name of Gargouille (sometimes called Garguiem or Goji), which ultimately had interesting consequences involving a rare privilege granted to the Archbishop of Rouen around the 8th Century A.D. (the right of the Archbishop to pardon one condemned man a year) and a legacy in gothic architecture (the grotesqueries we call gargoyles). Once on a time there was a dragon, and his name was Gargouille, and he lived in the forest of Rouvray. Every day he issued from his den as soon as the sun was up, and prowled about seeking whom he might devour. The husbandman in his fields, the priest at the altar, the maid at her spinning-wheel,—all were alike to him: he gobbled them up. He breakfasted at one village, dined at a second, supped at a third. Young or old, fat or lean, tough or tender, — it did not matter. A couple of youths were enough for breakfast; a man-at-arms, or a ploughman, with a few little boys and girls, sufficed for dinner and dessert; and a young Caletian lass afforded something light for supper. The country at last was thinned of provision; every day he had farther to go for his bite and sup; and at last Gargouille put his long snout, wistfully, but not rudely, over the walls of Rouen. The citizens were dismayed. No man durst stir out of the town. If a young woman stole to the water-side to give her sweetheart the rendezvous (for young women in love—and when are they out of love?—have no fear), Gargouille was there. If little Tommy or Jacky let themselves down the ramparts to play at marbles in the road, or gather filberts in the wood (for little boys have no sense), Gargouille was there. Every day somebody was missing. At last, Saint Romain, awaking one morning from a dose which the smell of the incense always threw him into, determined to take the matter in hand (Ritchie, 1834, p146-147). Of course, at the time Romanus of Rouen was not a saint, rather the humble Archbishop of Rouen, and it gets a little disheartening for a clergyman when his congregation keeps getting eaten. Tends to call for a little divine intervention, so he did what any reasonable guy with a serious superhero complex would. He marched off to deal with Gargouille, but had the forethought to pack the neighborhood dragon a lunch in the form of a prisoner condemned to die. The people of Rouen suffered, as did the inhabitants of many other mediaeval towns, from the depredations of a certain dragon. The dragon who devastated the neighbourhood of Rouen, bore the name of Gargouille; from her lair in the reedy swamps beside the river she came out to devour the inhabitants of the city. St. Romain, however, took a condemned criminal and using him as a bait, enticed the dragon from her den, and then by the use of the holy sign subdued the monster to his will, and tying the end of his stole round its neck, led it into the city, where it was slain and its body burnt amid the rejoicings of the people. To commemorate this deliverance, it is said that the king granted the Privilege de St. Romain above described, to the cathedral chapter. We need not be surprised to learn from the legend that the saint restored life and soundness of limb and body to the criminal whom he had used as a bait, and that the criminal, on account of his part in the deliverance that had been wrought, was set at liberty (Perkins, 1903, p9-10). Opinions vary as to whether the condemned man that accompanied Saint Romanus on his extermination job was a volunteer, or rather was “volunteered”, but as a ward of the people who came up with the Bastille and the guillotine (albeit many years later), we can assume the prisoner faced a long wait in a dank dungeon and an execution in some unpleasant manner, so a little dragon hunting might have been a break in the monotony. They don’t call it the Dark Ages for nothing. Evidently, he made a good show of being bait and was set free. They kind of gloss over the part where Saint Romanus had to “restore him to soundness of limb and body”, which is highly suggestive of the possibility that while Romanus was busy getting his wrathful god on, Jacque Convict was being roasted alive or gnawed upon by a gigantic reptile. Details. In the end, it paid to have a saint around for all parties except Gargouille, and in gratitude for services rendered and recognition of the human bait, King Dagobert I (603-639 A.D.), incidentally, the last Merovingian king of the Franks to wield any power before those nasty Carolingians took over, is said to have granted the right to pardon one condemned criminal a year on Ascension Day to the Archbishop of Rouen in perpetuity, a right that was exercised for another 750 years, until roughly the French Revolution. Some scholars assume the content of the story to be wholly allegorical, and suggest that rather than a pest control specialist, Romanus distinguished himself as a civil engineer by building embankments to protect Rouen from an overflowing Seine River, citing mythological associations from elsewhere in Europe of dragons with misbehaving rivers. Now preventing flooding is still pretty cool, but let’s face facts, it just doesn’t have the same miraculous cachet as going toe to toe with a dragon. King Dagobert gave the clergy of Rouen the annual privilege of pardoning a condemned criminal on Ascension Day; a right exercised with many ceremonies, till the period of the first Revolution. This dragon, named Gargouille (a water-spout), lived in the river Seine; and as Romanus is said to have constructed embankments to defend Rouen from the overflowing of that river, the story seems to explain itself. The legends of Tarasque, the dragon of the Rhone, destroyed by St Martha, and the dragon of the Garonne, killed by St Martial at Bordeaux, admit of a similar explanation. The winding rivers resembling the convolutions of a serpent, are frequently found to take the name of that animal in common language, as well as in poetical metaphor. The river Draco, in Bithynia, is so called from its numerous windings, and in Italy and Germany there are rivers deriving their names from the same cause. In Switzerland the word drach has been frequently given to impetuous mountain torrents, which, suddenly breaking out, descend like avalanches on the lower country. Thus we can easily account for such local names as Drachenlok, the dragon’s hole; Drachenreid, the dragon’s march; and the legends of Struth, of Winkelreid, and other Swiss dragon-slayers (Chambers, 1863, p540). Puzzlingly, St. Isidore of Seville, usually a big fan of fantastical beasties seemed fairly certain in retrospect that Gargouille wasn’t a dragon, rather a dangerous whirlpool in the Seine, and that the diligent levee building of Saint Romanus destroyed it. St. Isidore of Seville discredits the existence of the Lernian hydra; inferring from its name that hydra only implied some torrent or lake which Hercules effectually confined within banks; thus giving rise to the tradition of his having crushed it with his club. The traditionary monster, called a gargouille, said to have lived near Rouen, and to have swallowed a prodigious number of victims, is now admitted to have been simply a whirlpool in the Seine, destroyed by an alteration in the banks effected by St. Romain, when Bishop of that See. The anniversary of this event, regarded as the deliverance of the city from a monster, was celebrated at Rouen till the period of the first Revolution; a prisoner being annually delivered by the city on the Festival of St. Romain in honour of the miracle. The gargouille or whirlpool, of Rouen, was but a modern edition of the hydra (World of Wonders, 1853, p53). There has been some confusion as to which King Dagobert gave the privilege to the Archbishop of Rouen, as some credit Dagobert I, who would have been alive at the same time as Saint Romanus, but others claim the right to pardon condemned criminals was afforded in the 8th Century A.D. King Dagobert III, the last Merovingian Dagobert died in 715 A.D. No need to split hairs. Suffice it to say that a Merovingian King of the Franks named Dagobert gave it the nod sometime between 629-715 A.D.
Another long-lived fete sanctioned by the Church is that of the ‘Privilege’ in Rouen. In that historic city on the Seine a narrow street leads down from the cathedral to the river, crossing on its way a large open space where stands the Chapelle de la Fierte Saint-Romain. With this ancient chapel is connected a curious custom, which was exercised for more than 750 years. The charter establishing it was granted to the Chapter of Rouen Cathedral by King Dagobert in the eighth century, and empowered the archbishop to release, once every year on Ascension Day, a chosen criminal from among those in the city condemned to death (Ingersoll, 1928, p173). So, until the French Revolution, in celebration, the people of Rouen had an annual party around Ascension Day which involved burning Gargouille in effigy and freeing a criminal with a death sentence, which of course seems just slightly more humane than the other way around. The most spectacular of these processions of monsters was the great Fierte of Saint Romain of Rouen. Once a huge dragon lived in the waters of the Seine, threatening the inhabitants of the countryside, swallowing ships and men. Saint Romain, in setting out to destroy the monster, asked for help. No one would go with him but a criminal condemned to death. The dragon was soon conquered by the sign of the Cross and led to the public square where it was burned with much rejoicing. To commemorate this act an annual fête was held until ended by the French Revolution. A criminal condemned to death was set free each year and given high honors. A wicker effigy of the monster called the “Gargouille,” holding a live animal in its mouth such as a young fox, a suckling pig or a rabbit, was carried in the procession attended by the Brotherhood of Gargouillards (Bridaham, 1930, pX). By the 13th century, humanity was still fairly unenlightened as a rule, but by then bureaucracy had been invented and perfected, so at least things slowed down a little bit. You could still get convicted of criminal as well as ecclesiastical crimes, often for the same act, and apparently this caused a bit of a turf war among the church and local royalty, which some unimaginative historians credit with generating the myth of Gargouille as the origin of the Archbishop of Rouen’s right to pardon a condemned criminal, a right that some claim was exercised, but not ever actually granted, since there is no documented evidence that anybody knew about the awarding of this honor until 1394 A.D. It is only at the beginning of the thirteenth century that the inevitable quarrels between the civil and ecclesiastical powers over a criminal claimed by both can first be traced; and it may be safely argued that while the privilege was not questioned it did not exist. It is as late as 1394 that the first mention of the famous “Gargouille” itself occurs in any reputable document. It was not till a twenty-second of May 1425, that Henry, King of France and England, did command the Bishop of Bayeux and Raoul le Sage to inquire into the “usage et coutume d’exercer le privilege de Saint Romain; for the good reason that in this year the chapter desired to release, by the exercise of their privilege, one Geoffroy Cordeboeuf, who had slain an Englishman. In 1485, one Etienne Tuvache, was summoned to uphold the privilege before the “Lit de Justice” of Charles VIII on the 27th of April; and in 1512 we find the definite confirmation of the privilege by Louis XII. ; and even yet there are only a few confused and vague rumours of the “Gargouille” and its saintly conqueror (Cook, 1901, p40). History gets boring quickly when you concern yourself solely with “reputable” documents, but even so, the fact that European heads of state were talking about “le privilege de Saint Romain” from about 1394 onwards as if everyone knew what they were referencing, is highly suggestive of the fact that both the story and the privilege were common knowledge long before, either that or the French were using a mythological dodge to get around the pesky legalities involved with killing an Englishman. We like our Saints to do big things. Simply being a better human being than us doesn’t really play well in Peoria. We want you to slay our dragons with just a piece of cloth, chewing gum, and an unwilling sidekick. Taking down the evil man-eating Gargouille has blockbuster movie written all over it, even if the truth of the matter is you piled up some dirt and stopped a flood, or changed the course of a river while everybody else was busy burning witches and not bathing. We want our heroes and saints to conquer our fear of things that go bump in the night, when in fact as Harriet Beecher Stowe observed, “To be really great in little things, to be truly noble and heroic in the insipid details of everyday life, is a virtue so rare as to be worthy of canonization”. And if you find you’ve got a problem with a dragon, call the Vatican. I hear they are more sympathetic these days. They must have a spare saint laying around somewhere. Andrews, William, 1848-1908. Antiquities And Curiosities of the Church. London [Eng. ]: W. Andrews & Co., 1897. Bridaham, Lester Burbank. Gargoyles, Chimères, And the Grotesque In French Gothic Sculpture. New York: Architectureal Book Publishing Co., 1930. Cook, Theodore Andrea, 1867-1928. The Story of Rouen. 2d ed. April 1901. Londonn: J. M. Dent & co., 1901.